In designing their large, elegant property, the homeowners wanted an entrance and driveway to complement their new home and create a bold statement. They wanted a beautiful, quality, low-maintenance solution. Inspired by a classic European stone theme, the final product would need to create visual interest and take into account the terrain and proximity to the home. 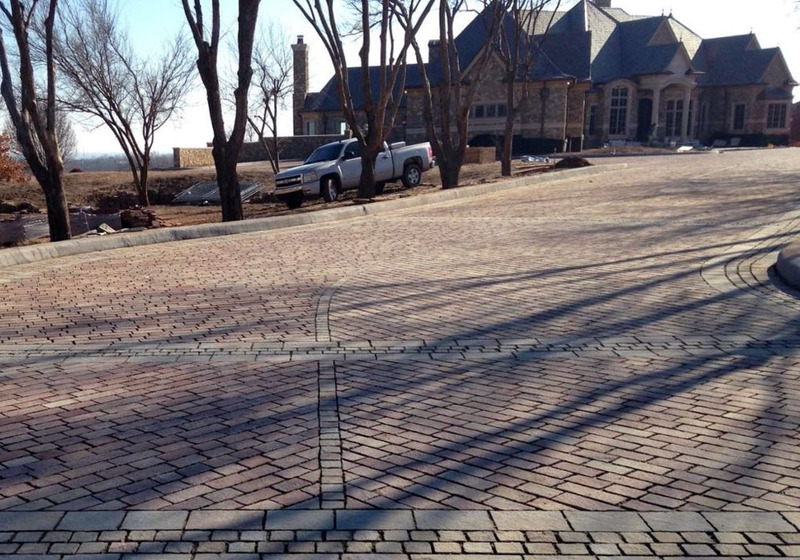 Porphyry offered a beautiful, quality, low maintenance solution to this Central Oklahoma home. Chosen for its creativity in design, a field of Copper Mt. Porphyry 4″X4′ snapped edge pavers & Patagonia Storm Grey Porphyry was chosen in several sizes for the borders and accents. 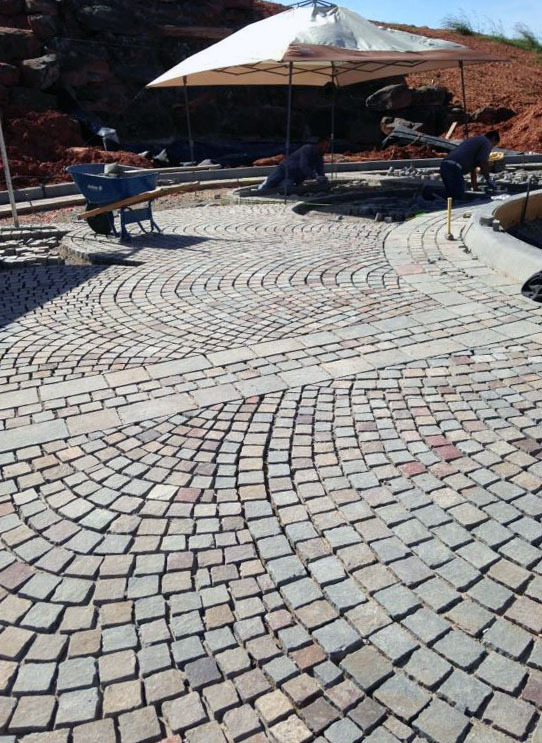 The homeowners selected Porphyry by Milestone Imports as the paving material for its flexibility in design and its ease of maintenance and durability. 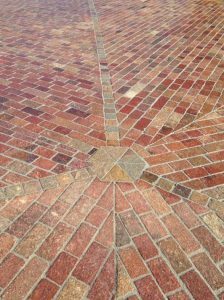 Porphyry is a paving stone used throughout the world and is popular due to its historic aesthetic and modern-day performance. It was a popular material during the Roman Empire and continues to be used throughout Europe and Scandinavia in classic roman patterns. It is low-maintenance and incredibly durable—consequently, it can stand up to any weather and rapidly changing temperatures. Porphyry has a compresive strength up to 27,000 psi with an absorption rate of less than 0.6%, which makes them an ideal paving solution. The homeowners achieved their classic European inspiration with Copper Mountain Porphyry 4″X4″ snapped edge pavers and Patagonia Storm Grey Porphyry in several sizes for the borders and accents. 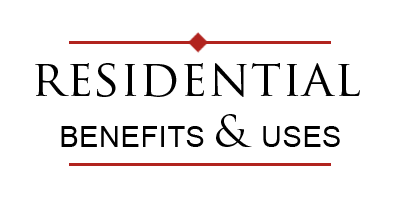 The GftK vdw 855 jointing mortar is a two part sanded epoxy which has a compressive strength of 6,500 psi with limited water permeability designed for use in heavy city traffic in any weather condition. The design patterns and styles selected vary from the driveway entrance to the circular round about in front of the house. The paving experts from Avants Stone recommended that the stones be set in the classic sand and cement method and for the jointing material to be the GftK vdw 855 jointing mortar in the Stone Gray color supplied by Stone Paving Technologies. The jointing mortar is a two-part sanded epoxy which has a compressive strength of 6,500 psi with limited water permeability designed for use in heavy city traffic in any weather condition. The combination of Milestone Imports Porphyry and Stone Paving Technologies jointing mortar creates a low-maintenance and sustainable solution. It allows for unique and classical look that added visual and practical value to the overall landscape design of this beautiful property.